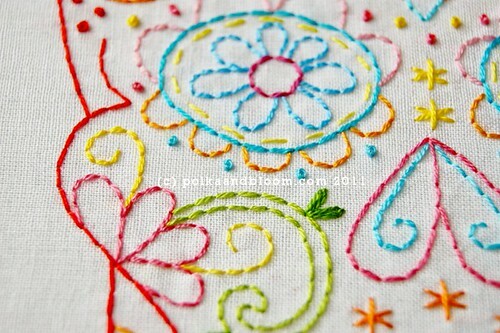 polka & bloom: Calavera - new embroidery pattern! 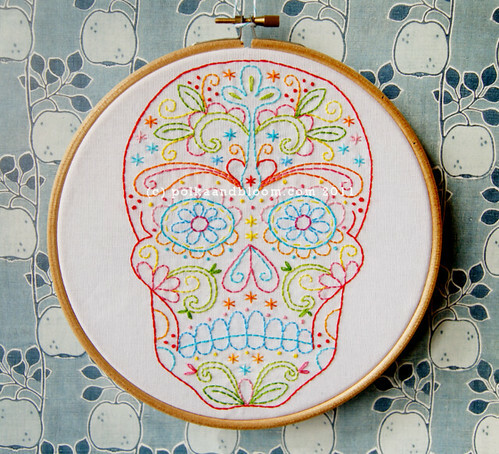 Calavera - new embroidery pattern! If you're planning on crafting something for Dia de Los Muertos, I've got just the pattern for you! Calavera, which means skull, is in the shop now. It's inspired by Mexican sugar skulls. And it's not the first time I've been inspired by those; you may remember the Marigold Sugar Skull pattern. But the skull in Calavera is a lot bigger! With lots of leafy details. The pattern is 2 patterns in 1 - because there are two different versions of it. And a flower motif which was also used in Marigold.. Lots of stitching fun for these ever darker autumn days! Love, love, love this pattern! I make a new Day of the Dead project every year, and I am currently working on your Marigold pattern, but I might have to do 2 this year! Thank you for the inspiration. Looking forward to the Christmas stitching class, too. do you have a pattern for the skull you can email me? faconstantino@comcast.net id like to try to make one.